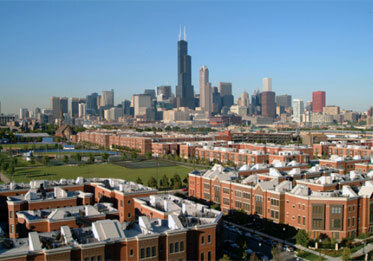 University Village is a major new real estate development over old Chicago neighborhoods, such as the area once known as the Maxwell Street neighborhood. This development took one of the poorest neighborhoods in Chicago and made it into a middle to upper-class income area. The development includes a mix of townhomes, walk-up condominiums, single family homes, and new construction and converted lofts in mid-rise buildings. You can click on the aerial photo below for a larger view that will expand even further. Note the green space interspersed throughout the development and the athletic field, tennis courts, and running track in the upper left portion of the photo. Those athletic facilities, which are open to the public, offer some of the greatest benefits of living in University Village. Ivy Hall, the real estate development located east of Halsted, is the latest phase of University Village and includes single family homes, condos, and townhomes. The entire area has been filled in except for the strip in the southeast corner of the development along the railroad track. We imagine that at some point the developer will build homes there but there is currently no sign of construction. In addition, homes will eventually be built as the final phase in the small area in the northwest corner of Halsted and 14th Place, where the sales office is located. The majority of the area is covered by single family homes, walk up condos, and townhomes. Here are the current MLS listings in University Village for these types of homes for sale. Listings highlighted in yellow are either a short sale or a foreclosure/ bank owned property. A few of these homes are developer units. You can guess which ones by the higher prices relative to the resale units. It always amazes us when buyers overpay for developer units. In addition, there are two newer construction mid-rise buildings at the southern end of the development (yellow outline above) that feature 1-2 bedroom lofts - 811 and 833 W. 15th St. These buildings have doormen and exercise facilities. Click on the links below for the current MLS condo listings. There are also two converted mid-rise loft buildings next to the 811 and 833 W. 15th buildings at 1524 and 1525 S. Sangamon (green outline above) that feature 1-3 bedroom lofts. These buildings have doormen. Click on the links below for the current MLS condo listings. The north facing views from the higher floors of these mid-rise buildings provide a spectacular view of the University Village real estate development and the Chicago skyline. You can also see the fireworks from these condos. Please note that as of 2/2/12 University Village is not FHA approved.